A 40-day online course that will transform your life from the inside out, led by 24 master teachers of Kundalini Yoga as taught by Yogi Bhajan. On sale for a limited-time only! The ancient practice of Kundalini Yoga is a science and technology that will transform your life from the inside out. With thousands of kriyas, asanas, meditations and pranayams available in Kundalini Yoga, mastering the basic concepts and techniques will give you the greatest benefit in your practice. Whether you are brand new to Kundalini Yoga, or you have been practicing for years, this course has everything you need to take the deep dive into a practice that will bring you to a new state of consciousness and awareness. This 40-day online course will transform your life from the inside out, led by 24 master teachers of Kundalini Yoga as taught by Yogi Bhajan. It’s a journey through the core teachings of this transformative yogic technology. Discover how to ignite your inner power and develop strength, flexibility, and peace in your body, mind, and spirit. Within us lives the most calm, serene lake of wisdom, the most beautiful, powerful pond of kindness, compassion and clarity. Let us understand and let us dive into it within ourselves. Whether you’re a beginner or lifelong student of Kundalini Yoga, mastering the basics is the most important step you can take to deepen your practice. 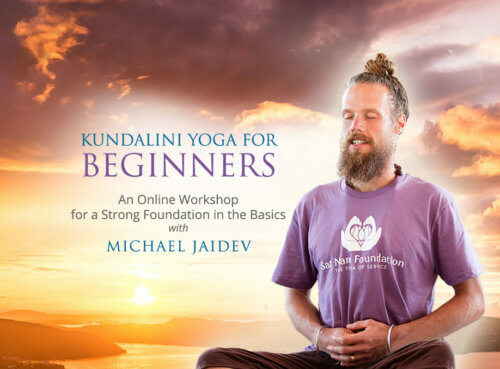 In this course, you will learn the secrets to the perfect Breath of Fire, discover how to align in any posture, learn to integrate the teachings of Kundalini Yoga into your daily life, master some of the most fundamental kriyas, and connect with a global community of yogis through our online forum. Ajeet Kaur is a recording artist, yogi, and healer. Growing up in a musical and spiritual home, her journey with sacred music, yoga and healing practices has been life long. As a child she had profound experiences with the healing lineage of Sat Nam Rasayan, healing through your presence and meditative mind, and quickly became a student of the lineage herself. Ajeet went on to receive a degree in Holistic Psychology and to practice as a healer, in addition to beginning her career as a musician, letting her music be a vehicle for sacred space. Ajeet is a fresh new presence in the world of sacred chant, but her music has quickly found its way into thousand of hands around the world, carrying with it the sense of peace and healing that has been her life's work. Ajeet has released four albums of sacred music, which have been celebrated as #1 on the iTunes world chart, and Billboard Top 10 new age chart. She has also collaborated with some of her own musical inspirations, including Snatam Kaur and Trevor Hall. Ajeet now travels the world sharing music and practices for healing at her concerts, workshops and retreats. Akahdahmah is a world renowned Spiritual living coach, Kundalini Yoga and meditation teacher and a 5th generation medicine man. A Grammy nominated percussionist and part of the musical duo Aykanna, Akahdahmah travels the world with his family teaching and playing concerts. A dedicated spiritual councilor and trained herbalist, Akahdahmah specializes in Holistic recovery from addiction, life coaching and serves at Internationally known holistic recovery center Passages, in California. He lives in Beautiful Ojai with his wife and 4 year old daughter. Anne Novak is a KRI Certified Kundalini Yoga teacher and healer who specializes in the neuroscience of pain. She combines degrees in physical therapy and hypnotherapy with a vast knowledge of yogic science and meditation. She currently studies energy medicine and silent communication with Mukeshanand Brahmachari. Anne’s teaching is powerful and insightful, combining a vast knowledge of the human body and a delicate grasp of the human heart. Her DVD “Radiant Health & Authentic Happiness” brings Kundalini Yoga to people all over the world. Description content for my profileWorld devotional music pioneer, Spirit Voyage Records founder, distinctive guitar stylist, songwriter, singer, producer, entrepreneur, accomplished yogi and lifelong spiritual practitioner, GuruGanesha is a man of many talents. His immense contribution to the yoga and conscious music movement is one of the genre’s most radiant jewels. GuruGanesha is one of those rare individuals who combine the heart and soul of an artist with the clear, quick mind of a businessman and the easygoing warmth of a born raconteur, no matter the stage he delivers from. His multi-faceted career has spanned several decades, bringing joy and inspiration to music lovers around the world and business confidence, motivation, and success to thousands in the global corporate community. Guru Prem Singh Khalsa named 'Posture Master' by Yogi Bhajan, is a Master Yogi and for over 40 years has been practicing and teaching Yoga, he has an advanced Kundalini practice & did Astanga for many years. He is a trainer of Teachers of Kundalini Yoga, and is an expert on body awareness in relationship to personal growth. He is the author of three books, “The Heart Rules”, “Divine Alignment”, and the New Everyday Devotion: The Heart of Being! GuruPrem has had an active practice at the World famous Khalsa Medical Clinic in Beverly Hills, as a teacher, structural, breath, Yogic & Massage Therapist for over 32 years. Jai Dev Singh is a yogi and teacher. His innovative Yoga and Ayurveda courses have been attended and studied by thousands of people throughout the world. His flagship teachings are offered through The Complete Course of Ayurveda, The Radiant Body Home Course and The Life-Force Academy. Jai Dev is a Clinical Ayurvedic Specialist and previously served as the Clinical Director at the California College of Ayurveda, as well as the director of the college’s Pancha Karma Center. He is a Kundalini Yoga teacher, certified by the Kundalini Research Institute. Jai Dev serves on the board of the Guru Ram Das Center for Medicine and Humanology. He is a partner at Floracopeia, Inc. Jai Dev lives in northern California with his wife, Simrit, and their son. Karena is a wellness expert for the modern world. As a motivational speaker, energy healer, yogi, inspirational mentor and TV personality she shares simple and transformational tips for the mainstream world. As a child she was highly sensitive to angels and perceived the deep human need for sharing and uplifting one another. Karena began studying yoga in elementary school after a near death experience showed her the beauty of bringing the angelic to the earth. While Karena spent many years hiding her spiritual wisdom working as an actress and model, she is now sharing her tips with a highly accessible and uplifting style. Karena’s comforting wisdom reminds us to align, ask and allow. She encourages everyone to connect powerfully with their personal truth through love, compassion, inner beauty and radiance. Karena shares a radiant and healing presence which inspires others to practice the art or clearing and expanding. Karena believes love is the highest intelligence of the universe, and with love all things are possible. She believes that every encounter is an opportunity for the everyday miracles to blossom into existence. Karena writes for The Huffington Post and she was recently featured on Veria Living and Bravo TV. She is the talent in the highly acclaimed yoga video, ‘The Power of Kundalini Yoga’, which can be found at Target, Barnes and Noble and Best Buy. Karena is also the voice on the IOS APP called ‘Relax and Attract with Karena’, and she just released her first book published by Sounds True called 'Essential Kundalini Yoga'. Karena is a member of Oprah Winfrey’s Belief Team, and she recently spent an evening with Oprah at The United Nations. Her clients are often professionals and celebrities who find Karena’s style accessible and enjoyable. Karena is married with two children, and she lives in the suburbs of New York City. Celebrated teacher Kia Miller has an ability to translate the subtle teachings of Kundalini Yoga in a highly accessible way. She is certified in both Hatha and Kundalini Yoga and teaches workshops, retreats and teacher trainings throughout the world. Krishna Kaur was born and raised in Los Angeles CA. She attended UCLA as a dance major and later switched to Theater Arts. In the early sixties, Krishna moved to New York to pursue her calling as a performer in off-Broadway, Broadway, Television and film as an actress, singer, dancer. She was proclaimed “A new kid on Broadway” a couple of years before she began exploring her spirituality. In 1970, Krishna met Yogi Bhajan, and as one of his first students, she took his direction seriously, and immediately began serving the Black community. She established a yoga center and a dedicated yoga community in South Central Los Angeles, which she headed for over 15 years. Since then, she has dedicated her life’s work to spreading the teachings of Kundalini Yoga s taught by Yogi Bhajan, traveling regularly to Africa, Europe, Canada, Mexico, South America, China and recently Iceland, leading Level 1 and Level 2 trainings and various workshops. Krishna Kaur, describing herself as a “Spiritual Activist”, devoted much of her time to teaching in detention facilities and underserved schools in the area, helping to reduce gang activity, and supporting political issues such as, the “Crack The C.I.A. Cocaine” awareness in Southern California. She often said, "The revolution is really one of the mind. We have to realize that the struggle is not just on a physical level. It is also in the mind. We have to change the way we think about the things we cannot control" Krishna Kaur's journey into Kundalini Yoga and the Sikh tradition took her to the spiritual capital of Amritsar and the "Golden Temple". In August 1980 she made history when, through a combination of circumstances she became the first woman to have ever sung Sikh hymns within the Golden Temple itself. In the 1998, Krishna Kaur initiated the founding of the International Association of Black Yoga Teachers. Later that same year, she incorporated Y.O.G.A. for Youth as a non-profit organization dedicated to serving our troubled youth and pregnant teens. Known for her musical talent, Krishna Kaur never completely gave up performing. In 2014, she released her first album, One Creator and her second album is in process. Krishna is known as a role model in so many ways, but what stands out most, is that she is one who truly lives the teachings and teaches from the depth of her soul and personal experience. She is a highly respected elder in the greater yoga community. She is strong, humorous, loves life and is deeply focused on keeping the teachings of Yogi Bhajan pure and authentic just the way he taught them. Krishna loves her work and brings that joy to everything she does. Markus Sieber is one half of the musical duo, Mirabai Ceiba. With his wife, Angelika, they have been sharing the music and technology of Kundalini Yoga in a modern, accessible way for over 15 years. Markus is a KRI-Certified Kundalini Yoga teacher with a strong personal practice. He believes in the power of a personal practice and in each individual's ability to find the teachings within themselves. His is a powerful message of the living power of these teachings and he believes that every person is a teacher, born from their own experience. Nirvair, Co-founder of the Kundalini Research Institute, is now its CEO, and serves on the Board of Directors of the International Kundalini Yoga Teachers Association. Yogi Bhajan honored him in April 2005 with the title Mukhia Singh Sahib, an honorary title indicating an elder in the Sikh Dharma International Ministry, and one only given to those who have done exceptional service to the community. He has taught over 11,000 classes attended by over 275,000 students in his career, including seminars, classes and retreats all over the United States and in Mexico, Italy, France, Russia, and India. As well as his Beginners’ Course, Nirvair Singh’s Kundalini Yoga DVD titles include Heal Your Back Now, Weight Loss with Kundalini Yoga, Early Morning Sadhana with Kundalini Yoga, Kundalini Yoga for Relaxation, Morning Stretch Evening Relaxation, Grace and Prosperity with Kundalini Yoga, Walk Tall with Kundalini Yoga and Kundalini Yoga for Athletes. His two leading book titles are The Ten Light Bodies of Consciousness and Art Science and Application of Kundalini Yoga. Nirvair Singh Khalsa lives with his family in Santa Fe, New Mexico, having relocated from Anchorage, Alaska. He still vacations there, where he loves to run, ski, bike and hike in the mountains with his family. 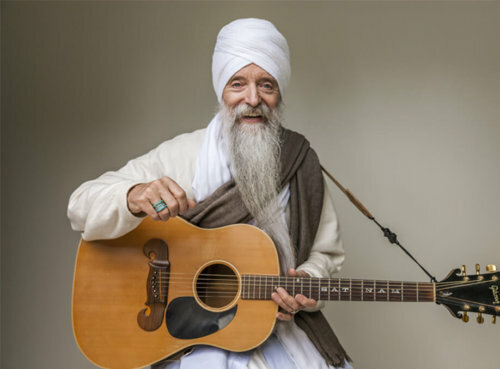 Prabhu Nam Kaur has been singing sacred mantra and Shabad from the Kundalini Yoga and Sikh traditions for 40 years. She is a teacher of Naad Yoga (the yoga of sacred sound) and a singer of devotional chant music, through which the listener/participant is transported to a sublime experience of the sound current. Her albums include Ardas, Sopurkh, Seasons of the Soul, and Mother’s Blessing (with her daughter Snatam Kaur). She lives in San Leandro California with her husband and the youngest son of their family of 6 children. Dr. Ramdesh is a KRI Certified Kundalini Yoga and meditation teacher who has taught throughout the world, from the foothills of the Himalayas to the suburbs of New Jersey. She has a Master’s from the Courtauld Institute in London and a Doctorate from the Emerson Theological Institute in Spiritual Studies. She has been featured in Yoga Actuell in Germany and Austria, and in Yoga Journal and LAYoga in the United States. She is a faculty member at the Kripalu Center for Yoga and Health. The author of "The Body Temple: Kundalini Yoga for Body Acceptance, Eating Disorders, and Radical Self-Love", she is also the co-author of "Yoga and Mantras for a Whole Heart" with Karan Khalsa, and has several best-selling guided meditation albums that create deeply healing and accessible meditation experiences for all. She hosted "Spirit Voyage Radio with Ramdesh" on Unity.FM and iTunes, a podcast that brought mantra and meditation to over 300,000 annual listeners for seven years, and now hosts "The Body Temple with Dr. Ramdesh", a podcast to bring yoga and meditation to people struggling with body image. Dr. Ramdesh serves on the Board of Directors of the Sat Nam Foundation and You Go Girl Yoga. Sat Siri, a former ballet dancer with the Australian Ballet Company, has been practicing yoga and meditation for over twenty years and teaching Kundalini Yoga for almost fifteen years. She was blessed to complete her Kundalini Yoga teacher training under the guidance of Yogi Bhajan in 2003. It profoundly opened her heart. Soon after, she opened the first Kundalini Yoga Studio in Sydney Australia, and has been teaching in Australia, and internationally ever since. Sat Siri teaches and is part of the organizing staff of the KRI Level 1 Immersion course each summer in New Mexico and is a a Level 1 KRI certified Lead Teacher Trainer. Watching students become teachers is one of the most profound blessings and inspirations of her life. Sat Siri’s classes are uplifting, challenging, and healing at a very deep level. She believes it is everyone’s birthright to experience the peace, grace and blessings that awaken with daily Kundalini Yoga and meditation. She currently resides in New Mexico with her daughter. Simran has been doing Kundalini Yoga all her life, teaching for the last 20 years. She is an alignment expert having taught the postures & alignment portion of many Teacher Trainings for the last 15 years, she also is a certified Yoga Tune Up® teacher and an Ashtanga practitioner. She has lived in Los Angeles since 1990, with her husband, 'Posture Master' GuruPrem, raising two beautiful children. She has continued to practice and teach locally as well as around the world, bringing lightness, joy, ease and a smile to the yogic discipline. She has mastered(over 1,000 days of continuous practice) many meditations and Kriya including Bound Lotus and Kirtan Kriya. Siri Ved Kaur is known around the world for the delicious healing foods she prepares and the knowledge she has shared through her cookbook, From Vegetables with Love - Recipes & Tales from a Yogi’s Kitchen. She served as Yogi Bhajan’s personal chef in the 1970s and learned the art of yogic cooking directly from the master, who was often at her side in the kitchen. Since then she has taught many cooking classes and courses on yogic diet and has written numerous cooking columns and articles for Beads of Truth, Aquarian Times, and on Healthy.Net. Siri Ved continues to share whatever is on her mind (and plate!) about food in her yogic cooking blog, ConsciousCookery101.com. Snatam Kaur is an American singer, peace activist and author raised in the Sikh and Kundalini Yoga tradition. She has an amazing ability to transform traditional Sikh chants of India into a contemporary sound that appeals to the modern ear and awakens an ancient yearning in the soul. For over thirty years, she studied with and grew up in the presence of her spiritual teacher, Yogi Bhajan, while he was in his physical form, learning the essence of Naad Yoga, a form of yoga focusing on sacred sound. At the core of this practice is an essential experience of peace and healing which has helped her music to be accessible to people of all walks of life. She has taught and shared Naad Yoga and Kundalini Yoga and meditation through her recorded CDs, concerts, and workshops for the past 20 years as a part of her commitment to give people tools for a daily experience of inner peace. Her new book Original Light; the Morning Practice of Kundalini Yoga is a compassionate and supportive guide to creating a personal daily spiritual practice. Sukhdev Jackson is one of the international faces of the new generation of Kundalini Yoga teachers. Part of the world renowned Musical duo Aykanna, Sukhdev is a “Billboard Magazine” acclaimed musician with a diverse career spanning over 20 years. Mantra technology and women’s teachings is her love and expertise. Sukhdev is the founder of "Shakti School”, created to serve and train women to develop their true power through the Women’s teachings of Kundalini Yoga. She lives with her family in Ojai, CA and is working on her 7th album. Tej Kaur has been a student of Kundalini Yoga and Yogi Bhajan, the Master of Kundalini Yoga, since 1973. Yogi Bhajan designated her Custodian of the Archives of the Teachings in the early ‘90’s. She is a recognized authority and has been involved in numerous publications as transcriber, editor, and compiler including, "72 Stories of God, Good and Goods," and "The Master's Touch" books. Holding a Masters in Counseling, she worked for many years on Yogi Bhajan's correspondence during which she received extensive training from him on yogic counseling. Her classes are occasions to enjoy deeply meditative experiences and gain unlimited amounts of yogic knowledge. Tommy Rosen is a yoga teacher and addiction recovery expert who has spent the last two decades immersed in recovery and wellness. He holds certifications in both Kundalini and Hatha Yoga and has 25 years of continuous recovery from drug addiction. Tommy is one of the pioneers in the field of Yoga and Recovery assisting others to holistically transcend addictions of all kinds. Tommy is the founder and host of the Recovery 2.0 Online Conference series and the Recovery 2.0 Group Coaching Program. He leads Recovery 2.0 retreats and workshops internationally and presents regularly at yoga conferences and festivals. Tommy’s first book, Recovery 2.0: Move Beyond Addiction and Upgrade Your Life, was published by Hay House in 2014. Tommy and his wife, yoga teacher, Kia Miller, live in Venice, California, where they teach yoga and grow organic vegetables in their backyard. Do I have to be an experienced yogi to participate in this e-course? Previous yoga experience is not required. Kundalini Yoga can be practiced by all body shapes and sizes, and all levels of strength and flexibility. 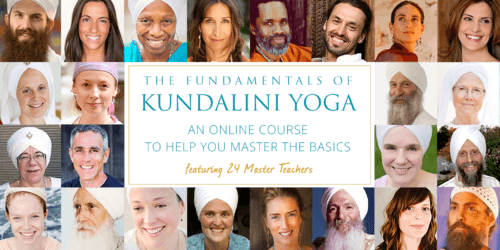 I already have a Kundalini Yoga practice – will I learn anything new in this course? Absolutely! This e-course is led by over 20 of the most experienced Kundalini Yoga teachers in the world…and the combined wisdom they offer holds so much value for beginners and advanced students of Kundalini Yoga. I have been through teacher training, and have been teaching Kundalini Yoga for years. Does this course have anything to offer me? Regardless how experienced you are, reviewing the fundamentals of this practice is highly encouraged. As you know, different teachers have different ways of explaining things – and you will often have aha moments when you hear something explained in a new way. Additionally, this course is reviewed and approved by the Kundalini Research Institute, so you can rest assured that the material presented represents the most up to date information available. Reviewing the fundamentals of Kundalini Yoga will serve you and your students in the best possible way! No. The yoga presented in this course is for all levels of yoga practitioners, from beginner to advanced. Any skill level will be challenged to learn and grow in their practice of yoga! Kundalini Yoga is known as the yoga of awareness – and by practicing you will be able to recognize your current limitations, and also recognize when those limitations are illusions that are holding you back. What equipment do I need for this e-course? To participate, you should have regular access to the internet. This course can be accessed from a computer, cell phone, ipad, or any other mobile device. We also recommend that you have a yoga mat, blanket, and a pillow to sit on if you are unable to sit comfortably on the floor. Can I take this course at my own pace? Yes. You will have lifetime access to all of the videos and handouts included in this e-course. What are the technology requirements for this course? You will need a computer or mobile device with access to high-speed internet in order to take this course. We recommend that your system and internet browser is up to date – some older versions may experience technical glitches! This course runs for 40 days. Every Sunday, there will be a live webinar to introduce you to the topics that are being covered in the materials for that week. There will also be time for questions during the webinar. After the live webinar, all of the materials for that week will be available when you log into your account. You can watch the videos at your own pace, and review them as often as you like. To participate, you should have regular access to the internet. This course can be accessed from a computer, cell phone, tablet, or any other mobile device. We also recommend that you have a yoga mat, blanket, and a pillow to sit on if you are unable to sit comfortably on the floor. If I can’t make the live webinar, will I be able to watch it later? Yes, the webinar will be recorded and uploaded with the course materials for that week. The lessons are available to stream only, not to download. Is this course eligible for CEU’s? Yes – this course qualifies for 15 non-contact CEU’s with Yoga Alliance, under the criteria for substantial education. Yes! You will have lifetime access to all of the videos and materials included in this e-course. You are free to work through the lessons at a pace that feels appropriate for you. Don’t Miss Your Opportunity to Join This Transformative Course!